C# and the .NET Framework provide a complex set of tools and technologies for building software applications on multiple platforms. This course covers the basics of what .NET is—along with a bit of history, and where Visual Studio and C# fit into it. Don will explore a simple .NET application so that you can begin to see the structure of both C# code and .NET projects. 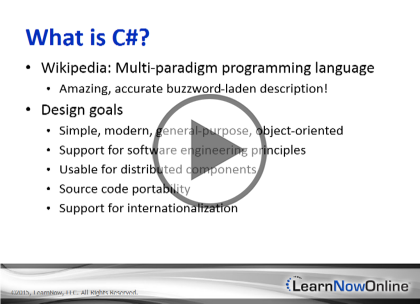 Then he'll delve into the C# language and why it is such a compelling tool for application development.